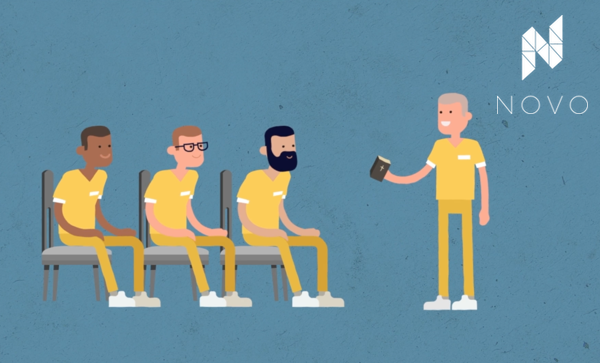 One example of this vision in action shared in the CRM / Novo introductory video (see below) is taking place in prisons: In US state prisons, a friendship with one inmate led to Bible studies with many others. Now people are discovering Jesus in five prisons and the good news has reached beyond the walls to their families and friends. We first shared about the gospel movement happening in the Indiana prison system back in 2015, when hundreds of people were becoming followers of Jesus. In the three years since the initial telling, that movement has multiplied from reaching hundreds with the good news to reaching thousands, it has expanded to eight different prisons around Indiana, and it has inspired other believers to start similar movements in other prisons around the US and even internationally. This movement continues to expand. Phil Alessi, the CRM / Novo staff member who unexpectedly launched this movement through his meetings with just one inmate, Donnie, can chronicle about 3200 new disciples who have come to Christ through this movement in the three years since this video was made. Scotty, the prisoner-turned-pastor in the video, has seen about 1500 people come to faith in the last year alone through his prison ministry. The story of what’s happened in Indiana has inspired many others to launch similar ministries and refined strategies for leaders who already had ministries going in prisons. This is one of the key ways the gospel movement in Indiana has gained momentum—not just through the prisoners themselves, but through the multiplication of new ministries all over the world. The gospel movement in Indiana has become a “learning laboratory” for movement, and leaders working to launch movements in all kinds of contexts (not only prisons) have been able to glean valuable strategies and encouragement from it. Chris, the other person featured in the video, now trains others and travels with Phil, sharing his story with leaders launching Disciple Making Movements (DMM) and changing DMM from a philosophical strategy to a tangible, real-life thing for them. The three inmates featured in the video have continued to follow Jesus and make disciples, both in and out of prison. Donnie, the first guy Phil met with in prison, has continued to lead people to Jesus while in jail. Last year Donnie asked Phil for a copy of the Discovery Bible Study (DBS) 10 Stories of Hope so he could do a DBS with the guys in his cell block—and people started coming to Jesus. Donnie told Phil, “All these guys have given their lives to the Lord and they want to get baptized.” Since the prison administration wouldn’t let Phil into the jail to do baptisms, local pastors decided Donnie should do it. So he baptized 11 guys in the jail, using a sink and a cup of water. Chris, who was Donnie’s “bunkie,” and the first guy to start doing Bible studies with him in the prison, continues to host DBS’s in his community where people are coming to know the Lord. Chris is a real disciple-maker, constantly on-call to help people in his life get through rough situations and discover Jesus. About a year ago Chris and his wife Kelly got connected with a local pastor, and together they started a local organization called H.O.P.E. (Helping Other People Everywhere). H.O.P.E. is mobilizing the Church to help people in great need, especially people in trailer parks, who tend to have some of the greatest needs in the community. H.O.P.E. is helping a lot of believers engage people outside the Church. They’re doing things like delivering pizzas to every door, clothing drives, helping people with utilities and furniture needs, and rebuilding some of the trailers. A DBS has started in one of the trailer parks as a result. Scotty, the prisoner-turned-pastor, has written the full story of his journey in a book, Behind the Wire, which he has handed out to prisoners by the hundreds. His prison ministry has expanded by leaps and bounds, and he recorded 1500 first-time decisions to follow Jesus in the last year. Scotty’s been traveling to prisons in various areas, not just locally, but also to other parts of Indiana and even a prison in Belize (Central America). Scotty has a volunteer team of about 70 people who go with him to these prisons, and they’re seeing about 100 guys a month giving their lives to Jesus. These three are not the only leaders and disciple-makers emerging from the movement. One of Chris’s prison-mates who was hard into heroin before he found Christ is now a pastor to gang-members. In the Porter County Jail, where the movement began, there is now an established “God dorm” with an intentional Christian discipleship program. And the original cell block (C8) where Donnie launched the Discovery Bible Study movement has had more than 20 leaders raised up to shepherd the guys there spiritually; when one leader leaves or gets transferred, another guy rises up to keep the movement going. This is just a sampling of what God has been doing. “You find the one that reaches the many,” Phil explains. “That’s really the point of it.” That’s how a gospel movement works. You can’t control it, you can’t keep your hands on it. You have to give it away, letting someone else be greater than you. That’s what’s happening in this movement. Phil found one. The rest is history—and a very different future for thousands of people. Phil Alessi and his wife Ruthann have been with CRM since 2002 and currently serve on the Advance Team (previously Accelerate) in Northwest Indiana. They have discipled people of peace who have ignited gospel movements in area jails and prisons. Their vision is to mentor and multiply the leaders of Disciple Making Movements.